Social Accountability is a division within the College of Medicine. It supports a number of programs and initiatives that address community health needs including indigenous health, primary health care, urban and rural under-served areas, gender and equity, eco-health, immigrant and refugee health and global health. The inaugural CoM Social Accountability Annual Report, presented by the Division of Social Accountability, outlines recent social accountability activities of the college in the four areas of CARE – clinical activity, advocacy, research, and education and training. Beyond the college’s commitment and structural supports for social accountability, the efforts of numerous units, divisions, partners, and individuals have helped address the unique needs of marginalized and underserved communities both locally and globally. Countless examples are provided within the report, alongside key outcomes and impacts of our efforts. The report is by no means comprehensive -- we at the Division know there is much more going on in the college that aligns with our social accountability and community engagement mission. If you have an example of a socially accountable project or activity within your department or unit that you would like to share, please send it to DSA Administrative Assistant, Joanna Winichuk, as we would be thrilled to highlight it in an upcoming iteration of the report, or a quarterly newsletter. The World Health Organization (1995) has defined the social accountability of medical schools as "the obligation to direct their education, research and service activities towards addressing the priority health concerns of the community, region, and/or nation they have a mandate to serve. The priority health concerns are to be identified jointly by governments, health care organizations, health professionals and the public." 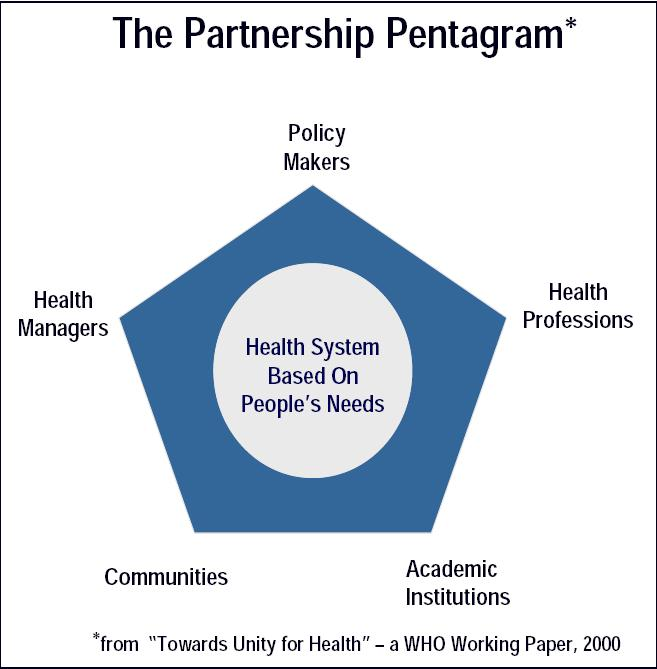 Embedded in the WHO definition of social accountability, the Partnership Pentagon reflects the five-way collaborative relationship that must exist for those involved in providing a health system based on people's needs. Health Canada has published a document, Social Accountability: A Vision for Canadian Medical Schools (2001) which articulates the principles by which medical schools can incorporate social accountability. The College of Medicine's Social Accountability Committee use the CARE model (Clinical activity, Advocacy, Research, Education and Training) as a guiding tool for social accountability initiatives toward priority health concerns of local, regional, national and international communities while working towards a health system that is more responsive and socially accountable. A Presentation to departments at the College of Medicine, University of Saskatchewan. 130 organizations and individuals from around the world with responsibility for health education, professional regulation and policymaking participated for eight months in a three-round Delphi process leading to a three-day facilitated consensus development conference. The Consensus consists of ten (10) strategic directions for medical schools to become socially accountable. A 2-year Global Health Certificate offered by the College of Medicine for undergraduate medical students that combines academic courses and service learning experiences in marginalized under-served communities locally and globally. Making the Links started in 2005 as a unique service learning experience offered by the College of Medicine. Selected undergraduate medical students experience community health and development in three contexts: 1) an urban underserved community at SWITCH (the Student Wellness Initiative Towards Community Health) in Saskatoon and SEARCH (Student Energy in Action in Regina for Community Health Inc) in Regina; 2) remote communities in northern Saskatchewan (Île-à-la-Crosse, Dillon, Kawacatoose, and Pine House), and 3) international communities globally. The College of Medicine is a leader in indigenous health programs, education, and services. We have a multitude of opportunities for indigenous and non-indigenous students to learn about indigenous health, culture, and community. Ten percent of first year spaces are reserved for indigenous students. Awards for indigenous students are available, along with mentorship from pre-med right through residency. The committee oversees the College's global health initiatives, and promotes faculty and student engagement in health initiatives around the globe that support social accountability. The project aims to promote better access to health services to the minority official language community in Saskatchewan. Learn more. The committee seeks to understand and address unmet health needs of the growing immigrant and refugee population in Saskatoon and Saskatchewan. The Division of Social Accountability is excited to announce the launch of the Community Reciprocity Fund. The purpose of this fund is to foster and strengthen community-driven, knowledge-based activities and action-oriented strategies on the social determinants of health, health advocacy and the priority health needs of communities, while enhancing health student and health professional skills. The Division of Social Accountability works to support the college in aligning its medical education content on pressing issues faced by the community we serve. The Priority Health Needs Rooted in Social Issues document is an annual communication put out by the division that overviews some of the issues of particular concern for Saskatchewan and their implications for curriculum programming. The College of Medicine’s Global Health Committee oversees the College’s global health initiatives and works in collaboration with other groups promoting global health in the College and beyond. The Committee is responsible for dispensing funds from the College of Medicine to support the involvement of faculty, residents, students (both undergraduate and graduate), post-doctoral fellows, and non-faculty staff, including justified community partners in global health-related projects. This fund is intended to offset travel costs for a global health experience, initiative, collaboration or research endeavour. The funding is provided to support activities within or linked to projects or programs rooted in the concept of social accountability. Such projects or programs may include clinical healthcare, community-based healthcare, health promotion, health-related community development, social justice and health equity activities, and/or global health research initiatives. Awards can also be used to: 1) conduct global health research in an international setting; 2) undertake travel related to global health-related courses for either their program or for continuing education purposes; or 3) present their research at a global health conference. Priority will be given to initiatives that contribute to: 1) the internationalization of the College of Medicine learning environment; 2) raising awareness of global health issues among faculty and students in the College of Medicine and the University of Saskatchewan; 3) increasing global health awareness in the wider community; 4) increasing global health research into issues of concern in low-resource settings; 5) capacity building in health care, education, and research at international settings as well as capacity building in global health scholarship at the COM University of Saskatchewan. In addition to this, priority will be given to initiatives that seek to understand and address health inequities, take place in low-resource settings, involve projects or sites that have prior University of Saskatchewan faculty or community practitioner involvement and have a faculty member or community-based faculty willing to mentor the applicant. For further information, contact Carlyn Seguin. Deadline to apply is March 22, 2019. This award provides support to students 1) wishing to conduct global health research; 2) wishing to undertake travel related to global health-related courses for either their program or for continuing education purposes; or 3) wishing to present their research at a global health conference. The funding is provided to assist student’s research activities that are supported by or linked to faculty research partnerships, projects, or programs with low- and middle-income countries (LMICs). This award is intended to offset travel costs for a global health experience and/or elective requirement. The funding is provided to support educational activities within or linked to projects or programs attempting to address inequalities that exist both among and within nations. Such projects or programs may include clinical healthcare, community-based healthcare, health promotion, health-related community development and/or research initiatives. This award provides support to community partners affiliated with the College of Medicine who would like to become, or are, engaged in global health service-learning, teaching and research opportunities. This faculty competition was established to support the development of global health educational, research or development programs linked to the College of Medicine. In past competitions, awards were granted to faculty members for their efforts to promote/develop global health work in Australia, Eastern Europe, India, Kenya, and Greece among others. The College of Medicine is dedicated to support students in attending the Canadian Conference on Global Health. If you have a keen interest in Global Health and would like to represent the University of Saskatchewan in attending this annual gathering, please considering applying. Travel bursaries of up to $1,000 are available to College of Medicine students including undergraduate medical students, residents, physical therapy students and graduate students. The deadline for applications will be announced summer 2019. The 2019 edition of the Canadian Conference on Global Health has not yet announced its theme. But if you are interested in highlights from the 2018 conference, please follow the link. Contact: Carlyn Seguin, Global Health Manager, College of Medicine for more information. For more information on the 2018 Global Health Conference, please visit the event website. The College of Medicine Social Accountability 2016-2020 Strategic Plan was developed through consultation with faculty, students, and staff and guides the work of the Division of Social Accountability, the Social Accountability Committee and associated committees, and the CoM in its social accountability mandate. The plan is intended to be a living document and will grow and change as appropriate strategies are identified and progress is made. Goal 1: Integrate social accountability into learning at the College of Medicine. Education and training at the university models and teaches professionalism and community-responsiveness, provides meaningful opportunities for community service-learning, and incorporates social accountability into practical training and continuing education throughout the life of a physician’s practice. Goal 2: Integrate social accountability into research and scholarship at the College of Medicine. The drivers for research/scholarship are balanced between discovery-driven research and research directed towards meeting the needs of the local and global community. The research conducted contributes to evidence-based practice, quality care, and greater health equity. Goal 3: The College of Medicine will engage authentically with the community to anticipate and respond to emerging community health needs. We partner with patients and families, the community and health sector to design activities that address the priority health needs of the communities we serve. Our partnerships reflect a genuine commitment to meaningful collaboration. Community inclusion in the CoM’s activities grounds clinical, advocacy, education, and research activity in priority problems and changing community health needs. Goal 4: Uphold and expand our reputation as trusted leaders in social accountability through excellence in advocacy, partnership and scholarship. We are recognized agents of positive change. We speak out on behalf of underserved populations or neglected conditions and work with partners and policy makers to translate a vision of a patient-centered health care system. In 2011 the College of Medicine established the Division of Social Accountability to promote and supports the College's obligation to direct its Clinical activity, Advocacy, Research and Education (CARE Model) activities towards the priority health concerns of local, regional, national and international communities. The Division of Social Accountability provides administrative support to the Social Accountability Committee and its subcommittees in their work addressing community health needs in areas that include indigenous health, primary health, urban and rural underserved areas, equity, diversity and gender, immigrant and refugee health, global health and eco-health. The Division serves all faculty, students and departments of the College of Medicine as a semi-autonomous structure, with the Department of Community Health and Epidemiology as a base of operations. The College of Medicine's Social Accountability Committee conducts its work through a number of sub-committees and groups in partnership with faculty, students, practicing physicians, communities and administration. The Social Accountability Committee is a standing committee of Faculty Council at the College of Medicine, and directs activities administered through the Division of Social Accountability. The Division of Social Accountability is housed in the in the Department of Community Health for administrative purposes. The Head of the Division of Social Accountability oversees programming and reports to the Head of the Department of Community Health and Epidemiology on operational matters. The social accountability mandate is recognized as a College-wide mission, with social accountability activities visible within the College, Health Sciences and to the wider community.